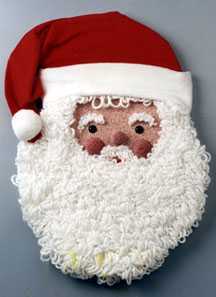 Combine styrofoam, red flannel and rug yarn to make a luxurious Santa door decoration for Christmas. 1. Wax serrated knife blade for easier, smoother cuts. Cut Santa face from foam sheet; cut foam balls in half. Glue 1″ half ball on face for nose and the two, 2″ halves for cheeks. 2. Paint face area beige; highlight nose and cheeks with rose paint. Paint on red mouth. Let dry. Press doll’s eyes into face; glue. 3. To make the beard, poke a continuous strand of yarn into the face every 1/4″, creating loops between each poke. Start by outlining the face with small, 1/2″ loops and work out towards edges, making gradually larger loops. As you work, spread a thin layer of glue on the area in which you’re working and then poke in the yarn. When beard is completed, poke in the following: two rows of very small loops for eyebrows; two to three rows of medium loops for mustache; and a few rows of long, 1″ loops along hairline. 4. Cut hat from red flannel. With right sides together, sew 1/4″ seam along edge to point. Trim and turn. Slip hat onto head; pin and glue in place. Gather excess felt to the back and pin and glue in place. 5. Cut 5″ x 15″ strip of white felt. Fold long edges together, meeting in the center. Glue cuff, with glued edges to the back, over edge of hat; hairline should still be showing. Fold cuff to back; pin and glue in place. 6. Gently position point of hat so it’s hanging down and to the side. Gather end to close and glue on pompom. 7. Pin and glue loop of yarn to back for hanging.